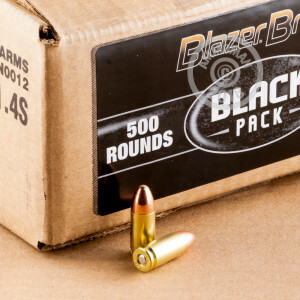 While they’re arguably best known for their aluminum cased ammunition, Blazer is no stranger to the world of brass. If you’re an ardent handloader or frequent a range that bans aluminum casings, then these brass cased 9mm cartridges are a worthy investment for you. This round features a 115 grain projectile, the full metal jacket of which makes it perfect for extended sessions of training and target practice as it will spare your pistol’s bore from the kind of rapid fouling that chips away at accuracy. The bullet’s base is fully enclosed by its jacket, so you’ll enjoy breathing in substantially fewer toxic fumes while firing it as well. This round also features CCI’s own non-corrosive Boxer primer which ensures reliable ignition with every shot. 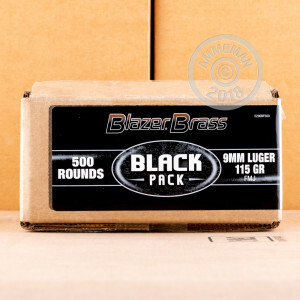 With 500 of these rounds to work with you’ll have just what you need to stay proficient with your everyday carry. And remember, all orders over $99 ship free from AmmoMan.com!